Want to send some important messages or files over emails. The best way to send such type of mail and messages are to send with password protected or Send Encrypted Emails from you inbox, so no one can read those emails without decrypting the message. This one is the safest and secure method to send emails to your friends or coworkers. There are so many applications and addon which allows you to Send Encrypted Emails, but most of them for the Gmail users to send password protected emails. Now you can also use the same method to send encrypted email from your Gmail, Hotmail, Outlook, Yahoo or any other webmail accounts. All you have to use a website SafeMess, SafeMess is free to use website which allows you to send encrypted message that can only be decrypted if someone has the secret key that you’ve just created. Without that key or password no one can read you message or open it. With the helps of this website you can encrypt all your messages, Protect your emails, chat, IM messages, etc. Without using the decrypting key no one can access your messages. You can use this website on any of your browser. we tested this web application on most of the browser like Internet Explorer, Firefox, Chrome, Safari, Opera and Opera Mini. To get started visit the SafeMess site here, on the home page you will see the Message and password box to send the Encrypted Emails. On the password field just enter the password key to decrypt the message and in the message box type the message that you want to send the other person. Not only this site encrypts the message but also offers another nice level of security by destroying the encrypted message after a certain amount of time passes. 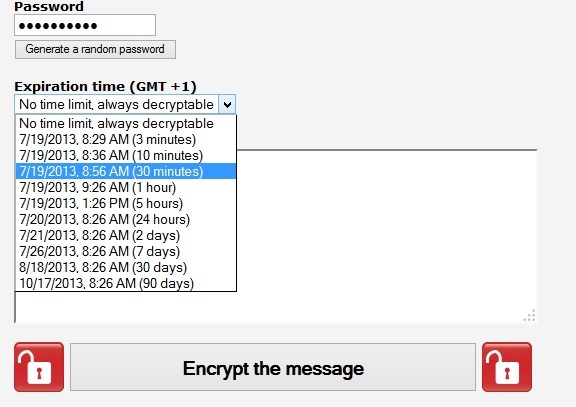 From the “Expiration Time: You can set up the time to destruct the message. In simple words if you make the message “self-destruct” in 24 hours, even if someone know the password to decrypt the message, it will no longer decrypt, even with the correct password. Once you are done with the message hit the “Encrypt the Message” button form the site and within a few minute you can see the output of the message in the “Message output” box. Now all you have to copy that message and paste on your compose message and send it to your friends. To open that message the recipient have to visit the same Safeness website and the recipient will copy this message, paste it into the website’s messages text field, type the password and then click decrypt. So this way you can secure your message from the companies or your from co workers. So why don’t you try this free web service to Secure you message and lock down your sensitive email messages? Have you ever used any of these services? Share your thoughts and feedback in the comments section below!